Spikelet! You’ll Like-et! 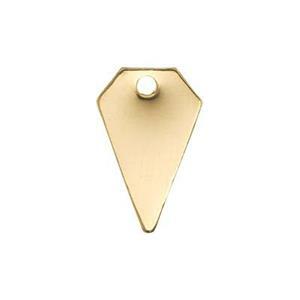 We think you’ll like the GF390 – 14/20 Yellow Gold Filled – Double Clad – 28 gauge Spike Ornament. Watch your Jewelry Sales Spike with these little diamond shaped spike ornaments! Tiny and eyecatching. Notes: Lightweight. Gold filled blanks are stamped or die struck. This type of manufacturing may leave light scratches on the surface. Since this type of scratching is normal it is not considered a product defect.